Automatically retrieve the wine name from the image and automatically enter the country of production and production area. We search from the database of about 10,000 wines and automatically input the country of production, production area, producer etc. You can search while looking at label photos, so it's very smooth! Graphs show the type of wine, graph by country of origin, number of wines per month and its breakdown. You can tell at a glance the trend of the wine you have drunk. You can sort and display wine type and country of origin. We will display the collection so far easy to see. 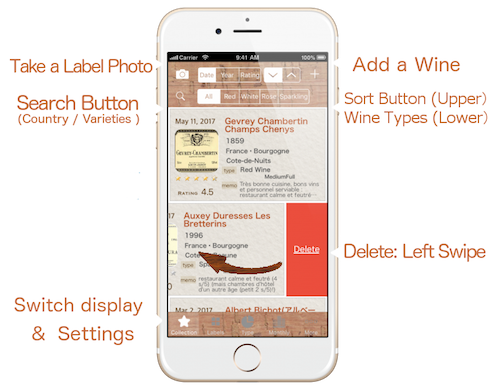 You can create a PDF file of all wine lists, wine types, and list by country of origin. You can save PDF files with Dropbox or other applications. Web search can be done by pressing search button such as wine name, production area, producer etc. In the Lite version, the number of stored wines is unlimited · All functions are available, but the data retention period is 2 weeks (14 days).